Yesterday’s trip to our new corporate overlords (I mean protectors) was disproportionately strange to me, as the entire past two weeks have been, ever since I learned that Microsoft is acquiring my company, Danger. What’s more natural in Silicon Valley than a rich but hidebound old company trying to stay ahead of the market by snapping up a successful, innovative startup? What could be less surprising? And yet there is a persistent sense of unreality for me that is itself taking me by surprise. When I first heard the news I was momentarily stunned, and then I recovered and said to myself, “OK, that’s that,” and expected to remain cool and unperturbed about it from then on. What other reaction even makes sense? But that’s not how it’s turning out. I’ve been in a kind of a daze. Why? Obviously it’s due to the echoes, for me, of NCD’s acquisition of Z-Code in 1994 (which also happened mostly in February; which, come to think of it, was the same month that I first interviewed for the Z-Code job in 1992). I was a very early employee at Z-Code and along with the rest of the engineering staff expected that we were on a path to taking the company public. We had a successful product and some lucrative partnership deals, we’d won some industry awards, and we always got good press. Now that I have a much better understanding of what’s involved in taking a company public, I can see how naïve it was to flatly insist that Z-Code turn down the NCD offer and continue trying to IPO. In 1994 the dot-com boom was still a few years away and Z-Code was having distinct growing pains; it was by no means certain we could remain a leader in the e-mail software market. But at the time none of this was obvious to us. All we knew was that the upside of this deal was much, much smaller than what we’d been toiling for, and that NCD in particular was an odd choice of an acquisition partner. (They produced X terminal hardware; we produced an e-mail client to run on a huge variety of platforms.) The engineering staff was disappointed and bitter. We opened bottles of tequila and vodka the night we got the news that the deal had closed; it’s the drunkest I’ve ever been. Z-Code’s founder, Dan Heller, who sold out to NCD over our objections, became the focus of our resentment. It has taken me this long to be able to say: sorry, Dan. I am staging a work stoppage. I don’t know when I’ll be back. Bye. In the end I grew a little more mature, professional, and jaded; the deal went through and the companies combined; and NCD managed Z-Code (and then itself) into the ground over the next few years. Our Z-Code equity translated into just enough NCD stock options to allow me and three co-workers to leave two years later (again, in February!) and bootstrap our own e-mail startup, which still exists today, so, not a bad outcome. But the psychic damage had been done, and my reaction today to being gobbled up by Microsoft is perhaps not so hard to understand. In an early draft of this morning’s blog post about the Danger staff collectively being summoned to Microsoft, I included a quote from the Giant in Twin Peaks — “It is happening again… it is happening again” — as a way to emphasize the strangeness of this whole episode for me (because it is happening again, just like it did fourteen years ago). 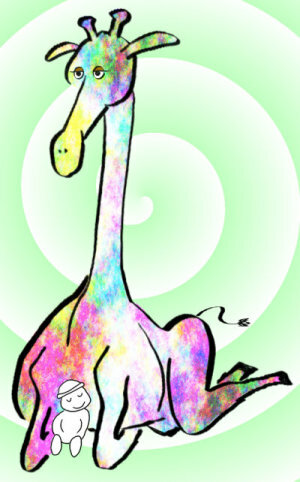 But I decided to save a discussion of the strangeness for a separate post, and I edited it out. Also, we recently re-watched one of the kids’ favorite movies: The Court Jester, with Danny Kaye. Now you might think that these two things are unrelated, and indeed they would be if it weren’t for Ken Jennings, who also has both things fresh in his mind, as he’s blogged about them just in the past couple of days. They’re not very substantial points of similarity, but taken together I’m calling them the eleventh way (ways 11a and 11b, if you like) that I’m like Ken. In 1994, Network Computing Devices bought Z-Code, the startup where I had been working. The staff of Z-Code was bussed from our Novato office down to Mountain View for a come-to-Jesus meeting. Later today, the staff of Danger will be bussed to Mountain View for a come-to-Jesus meeting with Microsoft. The first time, there was drunken carousing by the vanquished on the bus, and a videocamera to capture every embarrassing moment. Today there is likely to be drinking and videocameras again but this time there’s also YouTube for broadcasting the embarrassing moments to a global audience. 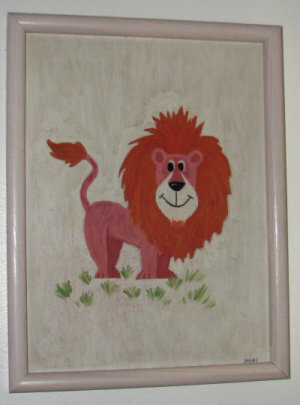 It all started when my dad painted a Friendly Lion to watch over my crib when I was an infant. The painting hung in my room my whole childhood (and as of a few years ago hangs near my bed once more). Years later I wrote a programming book for O’Reilly and Associates, a publisher known for decorating their book covers with animals. Their popular title Programming Perl is colloquially known as “the camel book,” for instance. I was hoping for a dog on my cover (after all, Alex the dog appears in the acknowledgments), but I was randomly assigned a giraffe. My disappointment was short-lived as the serene and stately giant grew on me. The next year I went on a trip to San Diego and the famous zoo there. At the giraffe enclosure a guide explained that their youngest giraffe, Ahiti, was only just learning to eat acacia leaves by stripping them from the branch with his teeth. Some of us got a chance to feed Ahiti and help him learn! When it was my turn I held out an acacia branch. Ahiti bent down, curled his long tongue around the branch, dribbled some surprisingly sticky saliva onto it and my hands, clamped his teeth and pulled his head back. Many of the leaves remained attached, sliding right through his inexpert bite. He tried once or twice more and did better — he was learning! Then it was someone else’s turn. 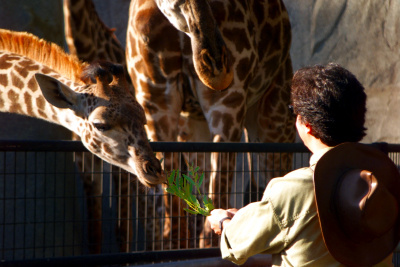 But I was hooked: I had helped teach a baby giraffe to eat. Giraffes were now incontrovertibly “my” animal. So when Andrea and I were expecting our first baby, the thought occurred to me that I ought to create a guardian animal for him like my dad had for me, and the obvious choice of guardian was a giraffe. although we never hung it up by Jonah’s crib in favor of a beautiful custom quilt made for Jonah by a family friend, featuring giraffes and other animals. 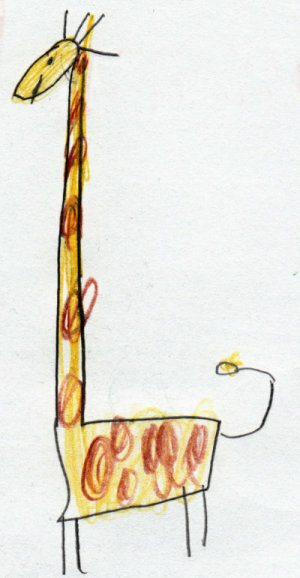 As of a few days ago we’re now full circle: Jonah has just drawn his first fully realized giraffe, and it’s amazing. My own speculative Indy IV story, published almost a year ago, included an oblique Roswell joke (“…he conceals the Falcon in the New Mexico desert… a dramatic near-crash during a test flight in 1947″) — which only increases my certainty that when it comes to screenwriting, I can do it better than (or at least as well as) the pros.